Heat oven to 350 degrees F. Grease and flour two 9 inch round baking pans. Combine dry ingredients in a large bowl. Add eggs, milk, oil and vanilla; beat on medium speed for 2 minutes. Stir in boiling water (batter will be thin). Pour into pans and bake 30-35 minutes or until wooden pick inserted in center comes out clean. Cool for 10 minutes and remove cakes from pans to wire racks. Cool completely. Frost with Chocolate Frosting . Melt butter. Stir in cocoa. Alternately add powdered sugar and milk. Beat on medium speed to spreading consistency. Add more milk if needed. Stir in vanilla. Makes about 2 cups of frosting. Top with chopped walnuts, pecans or shaved semi sweet Bakers Chocolate or candy bar. Combine 1 ¾ cups graham cracker crumbs, ¼ cup of finely chopped walnuts, ½ tsp ground cinnamon, 1 tbsp sugar and ½ cup butter, melted. Press on the bottom and up 2/3 of sides of a spring form pan. Beat smooth 3 well beaten eggs, two 8-ounce packages of cream cheese softened, 1 cup sugar, ¼ tsp salt, 2 tsp vanilla, ¼ tsp almond extract. Blend in 3 cups of dairy sour cream. Pour into crust. Bake at 375 degrees about 35 minutes or just till set; cool. Chill 4 to 5 hours. In a mixing bowl or in the bowl of a stand mixer, beat butter, sugars, egg, and vanilla extract on medium-high speed until light and fluffy. Add flour, baking powder, and cocoa powder and mix until just blended. Stir in dark chocolate chunks. Scoop approx. 1 1/2 tablespoonfuls of dough and roll into a circle. Roll cookies in sprinkles and place on ungreased non-stick baking sheets. If you’d like heart shaped-cookies, press tops of cookies to flatten slightly and with a toothpick, create an indent in the middle of the top to form the middle of top of the heart. With your fingers, shape bottom of cookie into a “V” shape. Cookies will expand a bit as they bake so you may wish to over exaggerate the heart shape so cookies will be clearly shaped once they are done baking. Bake 13-15 minutes, or until edges have crisped and tops are fairly firm to the touch when pressed. Let cool on baking sheets for a few minutes, and then transfer to a wire rack to cool completely. Defrost the puffed pastry dough. Pre-heat the oven to 375 F. Unroll the puffed pastry and use a heart cookie cutter to cut out heart shapes. 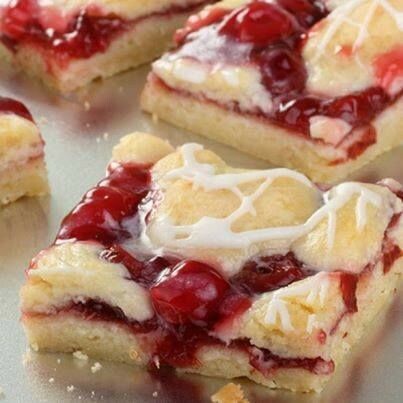 Place the hearts on an ungreased cookie sheet. Add ½ teaspoon of Nutella to each cookie. Cut a raspberry in half and press into the Nutella. Bake for 15 minutes until crisp. Preheat oven to 400 degrees F. In a nonreactive medium saucepan over low heat, combine dates, granulated sugar, and water. Cook stirring constantly, until thickened, about 15 minutes. Cool completely. In a large bowl or bowl of an electric mixer, place brown sugar, flour, baking soda, salt, and oats. Mix on low speed until combined. While mixer is running, add butter, 1 piece or 2 at a time. Mix until crumb like, with some lumps of butter no larger than pea size. Using your hands, press and flatten half of crumb mixture into a greased 9 by 13-inch pan. Spread cooled filling over crust. Cover with remaining crumb mixture, patting lightly. Bake until lightly browned, 25 to 35 minutes. Cool slightly and cut into bars while still in the pan. Gently remove cut bars from pan. Serve warm or at room temperature. Date bars, stored in an airtight container, refrigerate and freeze well. In the bowl of an electric stand mixer fitted with the paddle attachment, whip together butter and powdered sugar on low speed until combined, then increase to medium-high and whip until creamy, about 1 minute. Mix in egg, and then blend in vanilla and almond extract. Mix in almond mixture, then with mixer set on low speed, slowly add in flour mixture and mix until combined. Form mixture into a ball and drop onto a sheet of plastic wrap, then flatten into a 6-inch round disk, cover with plastic wrap and chill in refrigerator 2 hours. Preheat oven to 350 degrees. Dust work surface with flour, cut disk in half and then evenly roll out each portion into 1/8 to 1/6-inch thickness. Cut into heart shapes using a cookie cutter, then using a smaller heart shape cookie cutter, cut smaller hearts into the centers of half of the hearts. Carefully transfer to Silpat or parchment paper lined baking sheets (you can run a sharp knife or pastry scraper under cookies to help lift them if needed. Also, chill dough that’s not currently being rolled or baked, the hearts hold their shape better when cold), spacing cookies 1-inch apart. Bake in preheated oven 10 – 12 minutes until edges are lightly golden. Cool on baking sheet several minutes then transfer to a wire rack to cool completely. Spread strawberry jam over whole hearts, dust cookies with heart cut centers with powdered sugar then place those cookies over tops. Store in an airtight container. 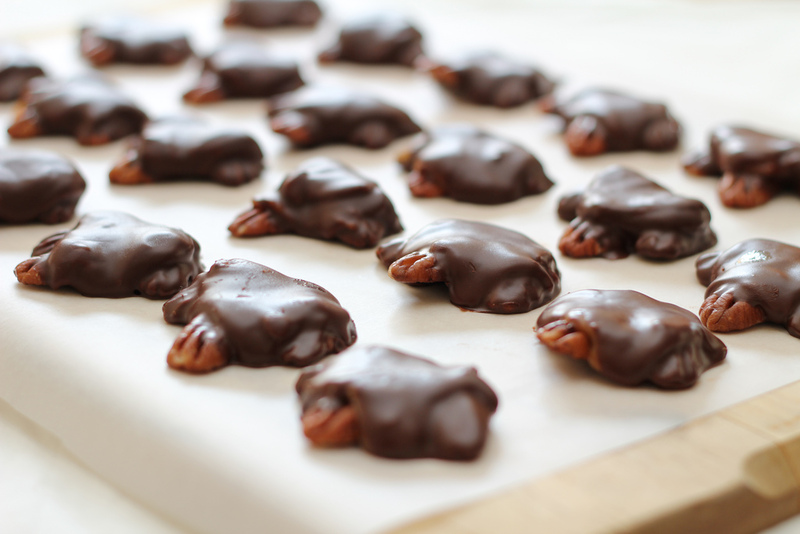 On waxed paper-lined baking sheets, arrange pecans in small clusters of four to five pecans each. For caramel, in a small saucepan, combine the milk, corn syrup and sugars. Cook and stir over medium heat until a candy thermometer reads 238° (soft-ball stage). Remove from the heat. Stir in butter and vanilla. Working quickly, spoon caramel onto pecan clusters. Let stand until set. In a microwave, melt candy coating; stir until smooth. Spoon over caramel. Chill for 10 minutes or until set. Store in an airtight container. Yield: 4 dozen. Fresh raspberries and edible blossoms such as pansies or small candy hearts for garnishing. TO MAKE THE MERINGUES: In the clean bowl of a standing mixer fitted with a whisk, on medium-low speed, beat the egg whites until frothy, about 1 1/2 minutes. Increase the speed to medium-high, add the salt and the vinegar, and slowly add the sugar, whisking until thick, about 2 1/2 minutes. Increase the speed to high and whisk until stiff and glossy, about 4 minutes. Sprinkle the cornstarch over the whites during the last minute of beating. Divide the meringue between the parchment circles and gently spread out evenly within each circle. Reduce heat to 300 degrees F. Bake in the middle of the oven for 1 hour. 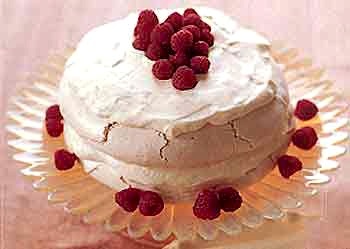 Turn off the oven and leave the meringues inside, with the door shut, until completely cool, about 4 hours. The meringue will be almond in color. WHEN YOU ARE READY TO ASSEMBLE THE CAKE: Whisk the heavy cream in a bowl with an electric mixer until stiff peaks form. Fold in the lemon curd. To assemble, place a dollop of the mousse on the cake platter. (This will help keep the meringue stable.) Place one of the meringues on the platter, pressing lightly. Spread half the mousse on top of the bottom layer. Add the second meringue and top it with the remaining mousse. Garnish the cake and platter with raspberries and blossoms. LEMON CURD MOUSSE Makes about 1 1/2 cups 6 egg yolks 1/2 cup granulated sugar juice and minced or grated zest of 2 lemons 1/2 cup unsalted butter In a bowl with an electric mixer, on medium speed, beat the egg yolks and sugar until pale yellow, about 2 minutes. Add the juice, zest, and butter. Transfer to a saucepan. The mixture may appear curdy. Cook over low heat, stirring with a wooden spoon until the mixture becomes smooth and thickens, about 10 minutes. Do not overcook or it will separate. Remove from heat. Pour into a bowl and allow to cool. Cover and refrigerate until you are ready to assemble. Place egg whites in a small bowl; let stand at room temperature for 30 minutes. Add cream of tartar; beat on medium speed until soft peaks form. Gradually beat in sugar, 1 tablespoon at a time, on high until stiff glossy peaks form and sugar is dissolved. Spoon meringue onto a parchment paper-lined baking sheet. Using the back of a spoon, form meringue into a 9-in. heart shape, building up edges slightly. Bake at 275° for 1-1/2 hours. Turn oven off and do not open door; leave meringue in oven for 1 hour. Remove from the oven; cool completely. In a small bowl, beat the cream cheese, confectioners’ sugar and vanilla until smooth. Fold in whipped cream until mixture is well blended. 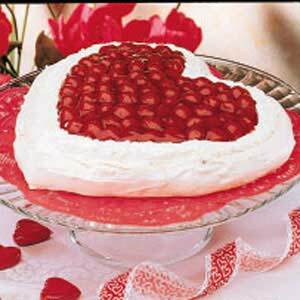 To serve, place heart on a serving platter; fill with cream cheese mixture and top with pie filling. Preheat oven to 350 degrees. Pour powdered sugar into a bowl. Remove dough from refrigerator, scoop dough out and with buttered hands, and shape into medium balls (about 2 1/2 Tbsp each). 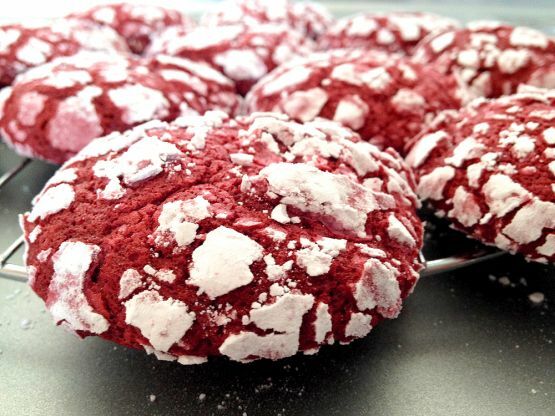 Roll cookie dough balls into powdered sugar and evenly coat. Transfer to Silpat or parchment paper lined baking sheets and flatten slightly, then bake in preheated oven 13 – 14 minutes. Allow to rest on cookie sheet several minutes then transfer to a wire rack to cool completely. Store in an airtight container. *If you want them a little more chocolate you can replace 2 – 3 Tbsp of the flour with 2 – 3 additional Tbsp of cocoa powder.